Enrique Olvera shows you how to fall in love with the city he calls home. Mexico City has enough art, food, and entertainment to keep you busy for days on end. 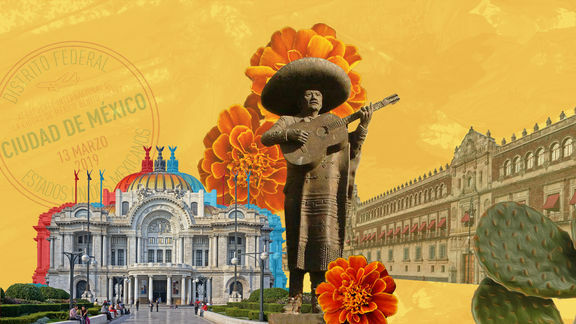 Let chef Enrique Olvera guide you through the land of street tacos, canals dotted with colorful trajineras, and lucho libre arenas. Just make sure to carve out time for an afternoon siesta—you'll need it. As the chef-owner of seven restaurants from Mexico City to New York, and soon, LA, it's remarkable that Enrique Olvera finds the time to keep up with everything going on in his home city. But Olvera talks about Mexico City with the knowledge of a critic and the love of a lifelong resident. He's never stopped absorbing what's new and revisiting the places that always get it right, which is probably why his cooking stays so innovative at his restaurants, including one of the World's 50 Best, Pujol. For breakfast, my favorite place is Lardo. It's a very casual neighborhood restaurant in Colonia Condesa, and the quality of the products and the execution is great. I order scrambled eggs—they have really good eggs with hola santa. I also really like their oatmeal with fresh fruit. For a more traditional breakfast, I'd go to either Fonda Margarita or El Cardenal. Fonda Margarita is a little bit rougher of a scene–sometimes people who have gone out all night crash there. El Cardenal is more family oriented. I really enjoy the pastries there, and they also make awesome chilaquiles. I usually go to a place called Cucurucho for coffee. I also like our purveyor, Buna. They have a small shop in the Rio de Janeiro plaza in Roma, and they roast in Doctores. Both coffee shops source in Mexico, whether it's Chiapas, Oaxaca, Veracruz, or Puebla. It's nice if you want to try the coffee that was grown in Mexico and roasted in Mexico City. My favorite bakery is Rosetta: they have a bakeshop a few spaces away from the restaurant and they have amazing bread and really nice pastries. There's also a new place that opened called Nero, they're doing really good pastries, French toast, waffles, that kind of thing. If you want to go classical, I would definitely try Contramar. It's an institution and if you haven’t been, that's a really good place to have a light lunch. I also really like Havre 77, a seafood-driven brasserie, with really good quality oysters and clams in Colonia Juárez. Hidden behind Havre is my favorite sushi counter in Mexico City, Kyo. They also have really nice ramen in the Cuauhtémoc neighborhood, called Rokai. If you want to do something that is a little bit more Mexican, try Amaya, which is owned by Jaír Téllez who owns Laja in Ensenada and MeroToro. Amaya serves Tijuana-style food and has an amazing wine list if you want to try a nice natural wine selection. Also try Hotel Carlota for lunch. Joaquín Cardoso is one of my favorite chefs in Mexico and it's probably the best bargain in the city: you pay twenty dollars and have a beautiful three-course menu that’s a mix of French technique with traditional Mexican food.